We set up BCB after years of trying to persuade BT to do something – anything – to improve local broadband. Where they’ve been consistent is their contention that our area is not a viable commercial proposition even for their half-baked FTTC service. They wouldn’t even engage with us to help develop our model through their community outreach programme, although they did tell The Telegraph that we’d turned them down. Not so. BT refused to bid on our CBS procurement last year, for exactly those reasons. We’re also both a ‘white area’ outside the intervention area for government funding under the DSSB programme and are excluded from consideration under it (thankfully) because of the existence of our project. We are now going through the idiocracy of a new procurement that meets the arbitrary and unnecessary requirements of BDUK (I’ve run projects with budgets 100x of this one on far less paperwork and delay), which should be issued in the next few weeks. Should. And, suddenly, a bunch of BT vans appear in the glen, erecting new poles and installing a run of 36 fibres up the glen. Not only that, they’re running the cable past the village and over the bridge to Stronvar. They’re also creating a total of half a dozen breakout points between Kingshouse and Stronvar. Which is interesting, as an FTTC service wouldn’t reach many of the properties along the way unless there were an improbable number of cabinets. So could they be planning to offer FTTP? Or do they care more for appearance than delivery? This is clearly being done on BT’s own volition, yet nothing has changed in terms of commercial viability and, indeed, this backbone on its own won’t reach most of our area. Is this then a blatant attempt to sabotage our project? Alternatively, Is it an opportunity for us to work with them to extend their backbone into our own network and serve the whole community? 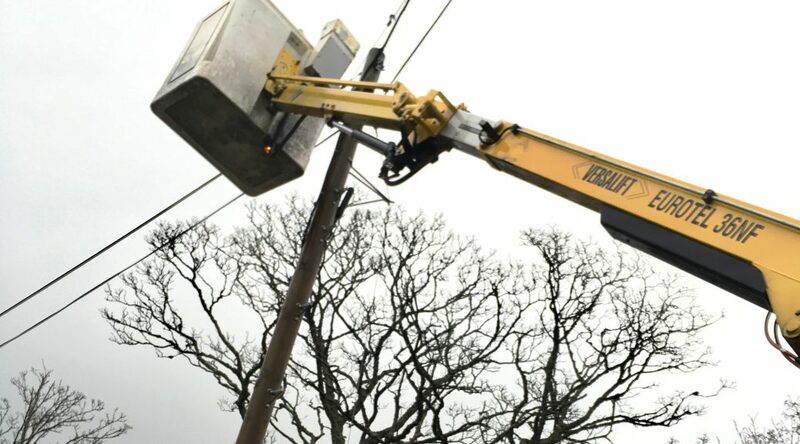 In the latter case it would save us the £50,000 cost of excess construction costs Openreach was going to charge us to connect to the Strathyre exchange? Given BT’s track record though, this development makes us more worried than encouraged. We’re trying to get hold of someone in BT who can tell us what is going on, and more will surely be revealed in the next gripping episode of the Balquhidder Broadband Saga (probably just before the episode in which we march on Westminster bearing lit torches and waving pitchforks. I think we’d be joining a very long queue there). Sadly I suspect that the BT Group are continuing with their quite unjust predatory policies and obstructing any other organisation relying on any form of state (i.e. EU regulated) subsidy. B4RN’s avoidance of any form of subsidy has allowed them to escape from all the rules and regulations imposed by Public Servants in many disguises. 36 fibre overhead distribution has been used by BT in some projects where the community has funded an extension to the FTTC network. It has also been used by BT in Devon and Somerset for their expensive and limited asymmetric FTTH products where around 30 local properties are fed from a GPON splitter. In EX17 4RS BT have commissioned a few FTTH services but have left many more without services even though the Wholesale checker says 300 / 30 services are available for all. Furthermore in so doing they have bypassed two intermediate hamlets left on Exchange Only lines sometimes with under 2 Mbps ADSL services. Their other tactic is to suddenly deploy FTTH where e.g. Gigaclear have announced a commercial development of true symmetric Point-To-Point FTTH at up to 1 Gbps. I cannot understand that mentality of providing an inferior non-expandable solution when the competition are quite clearly far superior and don’t behave in such unacceptable ways. One day BT might just wake up to the fact that helicopter stunts advertising WiFi without a mention of broadband don’t repair an exceedingly bad reputation. An abusive monopoly protecting its market – but failing to deliver at the same time – yet being subsidised by HMG to do more of the same. So ridiculous you couldn’t make it up.